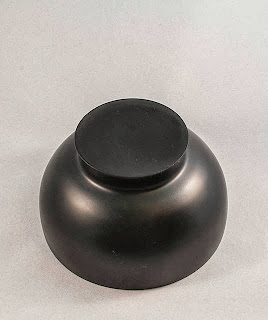 Out of the Trees - Artistic Woodturnings: Having some fun. Not posted anything new for a while as the turning has been put aside for other work for a bit. 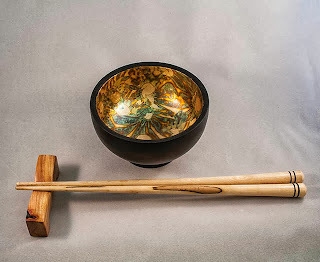 However, a forum challenge to make a rice bowl and chopsticks was something that definitely excited my interest, I had an idea in mind and wanted to progress it to completion. I had seen several stunning pieces of work recently making use of various metallic colouring techniques and I was sure this would look good on the challenge, so I procured the necessary materials and set too. Here then is the result. 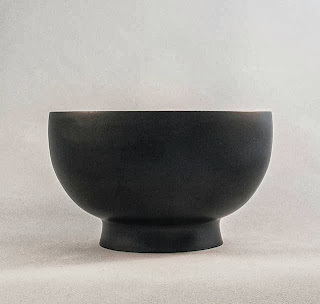 The interior of the bowl is coated with a type of metal leaf called Schlag metal, it is applied in the same way as Gold leaf and is very tricky to do, especially on such a tightly curved surface as this bowl's interior, but I think the effect is well worth the time and effort. Hi Kim, I was taught to use gold leaf at college and love using variegated gold leaf, small interior surfaces are tricky to do... but yours looks great. Thanks George, I think this variegated stuff is the business, there are so many to choose from, it was definitely Ron Campbells piece "Unknown" that got me excited about this sort of thing, that's a lovely bit of work. Lovely , right up my street.